Best Townhouse deal in Greenpoint! 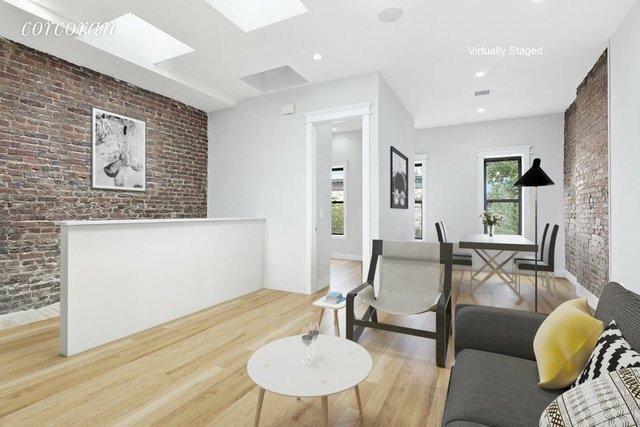 This beautifully renovated two unit home in North East Greenpoint is ideal for investors and end users alike. Currently set up as an owner's duplex with a large open concept kitchen and living room, 2 large bedrooms with large closets, 2.5 bathrooms, and a huge recreation room. The master has an en suite bathroom with a spa shower and private access to a beautiful deck overlooking lush gardens. The recreation room is over-sized and can accommodate a full entertainment system. No details were spared with gorgeous oak wood floors, dramatic ceiling height, state of the art appliances, and marble accents throughout. The top floor unit has three full bedrooms, an over-sized kitchen / living room with exposed brick and two wonderfully bright sky lights. Both units feature vented washer/dryer hookups and central air. Located on a beautiful tree-lined block, 19 Apollo offers over 1,500 sq. ft of living in this 19 × 50 brick building. Could easily be used as a killer single family home in the heart of growing Greenpoint. Situated minutes away from the hustle and bustle of coffee shops, restaurants, bars, and transportation off Nassau Avenue as well as a quick departure out of the city on the BQE.